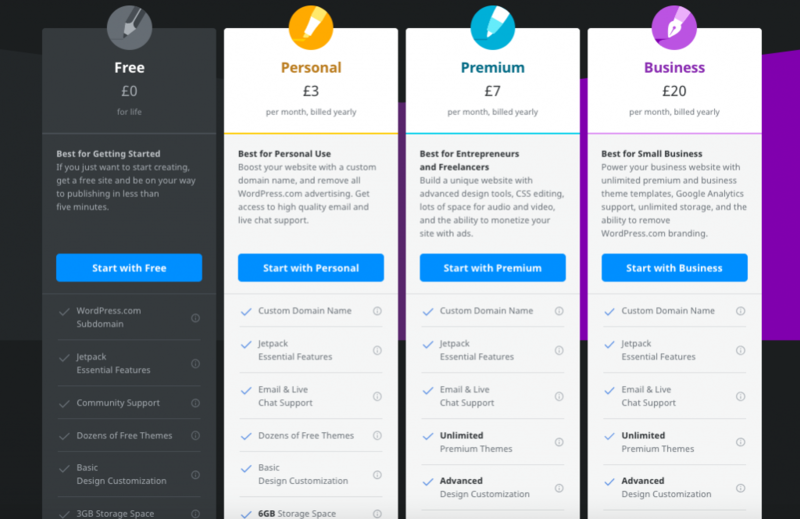 Self-Hosted vs Hosted Websites: which is best for your blog? One of the most important decisions to make right at the start of your blogging journey is whether to choose a self-hosted site or not. But what does that even mean? And how do you go about deciding? Well, in this post I will explain exactly what we mean by the terms hosted and self-hosted, and break down the pros and cons of both. What is a hosted website? As you can see, the offers range from a free site all the way through to a business site. The free package is fairly limited, as it would be with most providers. You’ll get a domain name in the format: myblog.wordpress.com instead of the catchier myblog.com. You get a small amount of storage and the ability to use the free themes that WordPress produces. Your site will be branded with WordPress adverts. If you are running a hobby blog that is just for personal use, then this option would probably suit you fine. However, if you are intending to grow or monetise your blog at any point in the future, you would need to at least go for the Premium package, since the Free and Personal packages do not support monetisation. You aren’t able to place any adverts or banners on your blog. Additionally, the Free and Personal packages don’t support plug-ins, which you may find really hinders your progress. For example, many bloggers use the Yoast SEO plug-in to help them optimise their posts, but on a hosted site through WordPress.com you wouldn’t be able to do this. How easy is it to set up a hosted blog? This is the easiest way to set up a blog, so if you’re just trying to learn a new skill or run a blog as a hobby, it may be a good place to start. You can quickly fill in your personal details, choose a name for your site and pick a theme. WordPress is quite user-friendly and will walk you through the steps. However, you may find that you outgrow a free or personal site fairly quickly. If you want to be taken seriously both by search engines and potential visitors to your blog, self-hosted is the way to go. So what does self-hosted mean? It means that you sign-up for a paid hosting account with a company, for example, SiteGround. You pay for your own domain name and have complete design control over your own site. It can seem a little more daunting but in all honesty, it is fairly easy to do. Once you have registered your domain, you need to choose which platform you want to use to build your site. This is where wordpress.org comes in. I know what you’re thinking – you just told me not to use WordPress? Well, WordPress.com and WordPress.org are actually different things. The first is the hosting platform as discussed above. WordPress.org is a building platform that you can install on any website and use as an editing and designing tool. There are many other platforms available, however, WordPress.org is one of the most popular and easiest to use. Some of the world’s biggest websites use WordPress behind the scenes! Just because you are self-hosted, doesn’t mean you’re on your own! There is a lot of support out there. In fact, one of the best things about WordPress.org is the huge number of people who use it. A quick Google search for any WordPress issues will bring up loads of results and forum discussions from other people who have managed to fix whichever problem you are having. They also have their own forum and customer support service. In addition, your hosting provider will usually have support available too. SiteGround has a particularly helpful set of resources on their user area, plus help is at hand via web chat or phone 24/7. I’ve already got a hosted site, is it too late to change to self-hosted? No, not at all! You can transfer your existing content to a new self-hosted site if you choose to. In fact, SiteGround offer a transfer service where they will do it for you, either for free or for a charge depending on your package. There are many tutorials out there which will guide you through the process step by step. It can be a little tricky so it might be best to ask for advice for your new domain provider. If your blog is a hobby, then, by all means, go for a free hosted site. But if you want to up your game you will need to go down the self-hosted route to get the best results. SiteGround currently has an offer on their StartUp package where you can sign up for £2.95 per month. Want to know how Twitter can help with your blog? Check out this post. This post contains affiliate links. I may receive a commission for purchases made through these links. Thank you!